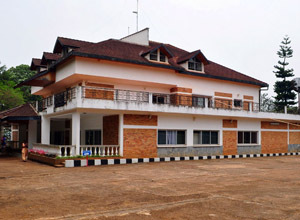 One seldom visited monument in Kigali’s backyard is the Presidential Palace Museum, the palace of former President Habyarimana, also known locally as ‘Habyarimana’s house’. In case you’re one of the five people in Rwanda who are unfamiliar with that name, Habyarimana was the president of Rwanda whose plane was shot down in April 1994, the event that sparked the Rwandan Genocide. Today the palace is a museum where visitors can see for themselves how the former president lived. 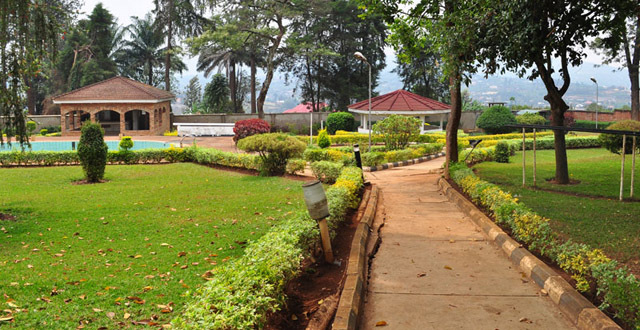 The Presidential Palace Museum is located in Kanombe, on the eastern outskirts of Kigali. 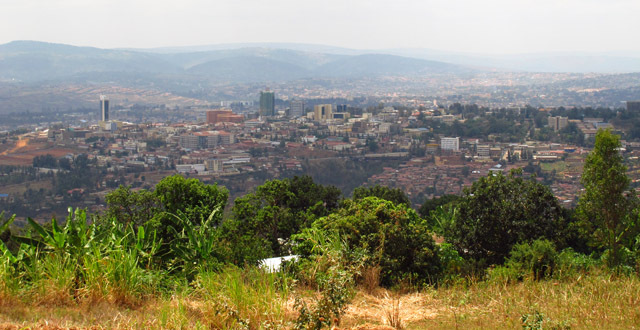 To get there just take the road to the airport and once you pass the airport continue driving for several kilometers until you come to the Kanombe military hospital on your right. Keep going and the road will change from asphalt to dirt. As you come to the large Kanombe primary school (again on your right) the road will fork. Take the left fork and that will lead you straight to the museum’s gate. The museum is open seven days a week from 9am to 5pm (except during umuganda, when they open at 11am). Entrance for non-residents is Rwf 6,000 and those with a resident visa pay Rwf 5,000, but be sure to bring you residency card as they do check. If you want to take photos you have to fork over another Rwf 2,000 and you can only take photos of the outside of the house and the garden. Photos of the interior are not allowed. Habyarimana commissioned the house to be built in 1976 and he moved into the place in 1980. According to the guide, the president hired a French architect to design the house, but pretty much took over every design decision. This is obvious in the palace’s eccentric and somewhat clunky internal layout of rooms that include everything from a “secret” passage to a room for practicing witchcraft and another room that was apparently used for torture and interrogation. The house itself is quite strange with some rooms in seemingly good condition and others showing extreme neglect and disrepair. The strange home gives an impression of Habyarimana’s own sense of fear and paranoia as Rwanda’s head of state during an extremely perilous time in the country’s history. There are sensors scattered around the house that were to inform the president if someone was walking through a certain corridor or traversing one of the many staircases. There is a hidden weapons cabinet built into the television cabinet in his entertainment room. Perhaps the most curious part of the house is the top floor that includes a chapel on one side and a room where he practiced witchcraft on the other where he ingested magic potions and sacrificed animals of all types alongside his in-house witch doctor. The grounds outside the house are more normal and well kept and include many beautiful trees of all types shading very pleasant patches of grass crisscrossed by stone walkways. Also included are a tennis court, swimming pool, an outdoor bar and some playground equipment. Near the centre of the back garden are the remains of a concrete pond that once housed the president’s beloved pet, a 300 pound python whose job it was to fend off evil spirits, as well as instilling fear in any of the president’s visitors who may not have been in is favor. At the very rear of the palace compound lies what may be the most impactful feature of the museum – the remains of Habyarimana’s Falcon 60 passenger jet that was famously shot down on April 6th, 1994, igniting the Rwandan Genocide. The plane coincidentally crashed in the president’s own backyard, killing all aboard, including the then president of Burundi. It also damaged the python’s pond. The animal escaped and nobody ever saw it again. Altogether the Presidential Palace Museum only takes about an hour or two to walk through, depending on how many times you stop and ask your guide questions. The house itself is in great need of renovation; however, there is something to be said for seeing the walls and furniture in the same condition as Habyarimana left them so many years ago during this troubling time in Rwandan history. It is definitely worth checking out – just keep your eyes peeled for any giant pythons in the grass. You must have made a typo Sean, we are still in 2012! The former presidential palace also hosts weddings which is a good way to see the gardens, but not unfortunately the interior, for free.